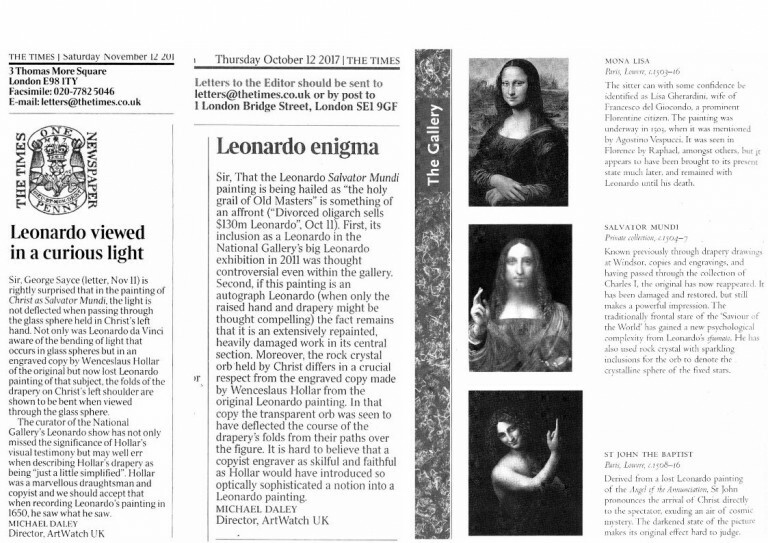 ITEM 4: “As Christie’s aggressively marketed Leonardo da Vinci’s Salvator Mundi before the work sold for an astonishing $450m last November, the art world raged anew with questions about the painting’s attribution– even though London’s National Gallery had largely settled the debate by including the work in its 2011-12 Leonardo show.” – Judith H. Dobrzynski, The Art Newspaper, January 2018 [emphasis added]. ITEM 5: “The painting Salvator Mundi will be shown at The National Gallery, London, exhibition: “Leonardo da Vinci: Painter of the Court of Milan” from 9 November 2011 – 5 February 2012. “It’s a historic moment: we’ll wait”, said Christie’s Global President and auctioneer, Jussi Pylkkänen, when bidding dried on the New York Salvator Mundi at the 15 November 2017 sale of modern art. It was certainly unprecedented. In the excitement no one noticed (or divulged) that what smashed records and had sleeper-hunting dealers swooning over prospective $1billion privately-owned Leonardo studio works was not the last Leonardo in private hands, let alone Leonardo’s male “Mona Lisa”, as Christie’s claimed, but, rather, a switch in which a twice-restored and substantially repainted work (Fig. 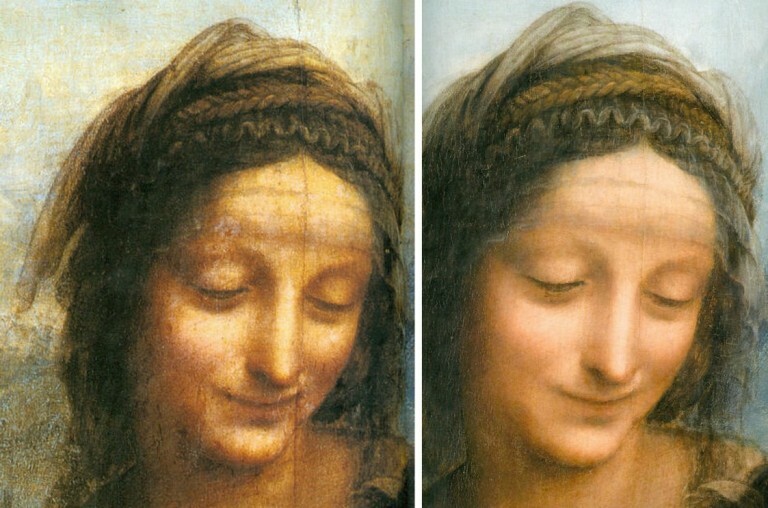 1, below left), which no expert between 1900 and 2007 had ever thought a Leonardo, was re-presented in a further cosmetically-restored and modernised form – “Every generation finds its own Leonardo”, it has been remarked. (See Fig. 1, below right). To put it another way, what fetched nearly half a billion dollars was the third state of an intermittent twelve-year long twenty-first century restoration-in-progress during which the restorer had first re-restored her own restoration after looking at the Virgin of the Rocks in the National Gallery, and then re-restored it again at some undisclosed point or points between February 2012 and November 2017. Above, Fig. 1: The attributed New York Leonardo Salvator Mundi as exhibited at the National Gallery in 2011-12, left; and, right, as sold by Christie’s New York on 15 November 2017. The picture above right is not the same as that above left. (To see how the two halves of the face are now disconnected, see Fig.17 below.) So when; on whose authorisation; and, on what rationale was the one eclipsed by the other? The Salvator Mundi returned to New York in 2012 from the National Gallery and was sold the following year for $80m to a Russian collector’s agent. Had it been re-restored before that 2013 sale? Or while in Russia? Or when at Christie’s prior to its 15 November 2017 sale? The first two restoration campaigns between 2005 and 2010 were said to have recovered a Leonardo but we do not know who first thought or said this. We do know that before 2007 none of the parties involved in the upgrading attribution thought the picture a Leonardo – not the then owners (a consortium with two identified members); not the restorer, Dianne Dwyer Modestini; not the restorer’s husband, [the now late] Mario Modestini. Mario, a man with an experienced Leonardo eye who had been commended by Berenson to clean the Kress pictures, who had attributed the Ginevra de Benci to Leonardo, who had reputedly brought a restoration-wrecked Rubens back from the dead, and who had wept for half an hour after seeing the National Gallery’s restoration-ruined pictures, thought the painting by a great artist a generation after Leonardo. In 2012 Frank Zöllner, the author of Leonardo’s catalogue raisonné (who had not been consulted on the new work’s authorship) saw the restored picture’s sfumato as being closer to a talented Leonardo pupil of the 1520s than to Leonardo himself. Zöllner further felt that the very extensive restoration of this “badly damaged painting” had made any assessment of the original condition extremely difficult. Christie’s spoke of an unusually broad consensus of expert support but the group consulted was small – approximately fifteen compared with the thirty invited to appraise the version of the Madonna of the Pinks that was upgraded to Raphael after a National Gallery symposium and a major scholarly article in the Burlington Magazine (February 1992). With this Salvator Mundi upgrade, none of the invited experts has published a case for the attribution but the ascription was endorsed by the National Gallery and the picture was included in its major 2011-12 “Leonardo da Vinci: Painter at the Court of Milan” exhibition as “a work in which Leonardo set out to make his divine inspiration obvious to all”. What had the undisclosed subsequent third restoration hoped to achieve – a better-than divinely inspired Leonardo? If an institutionally-celebrated Leonardo can be improved by a restorer, is the restorer a better artist than Leonardo – or a medium through whom he still paints? A question that might be considered is: Was the latest re-restoration undertaken to bolster an attribution rejected by four scholars in 2012 when reviewing the National Gallery exhibition, and challenged the year before – without apparent reply – in three Times letters (see Fig. 16 and ITEMS 5 and 7 above). Above, Fig. 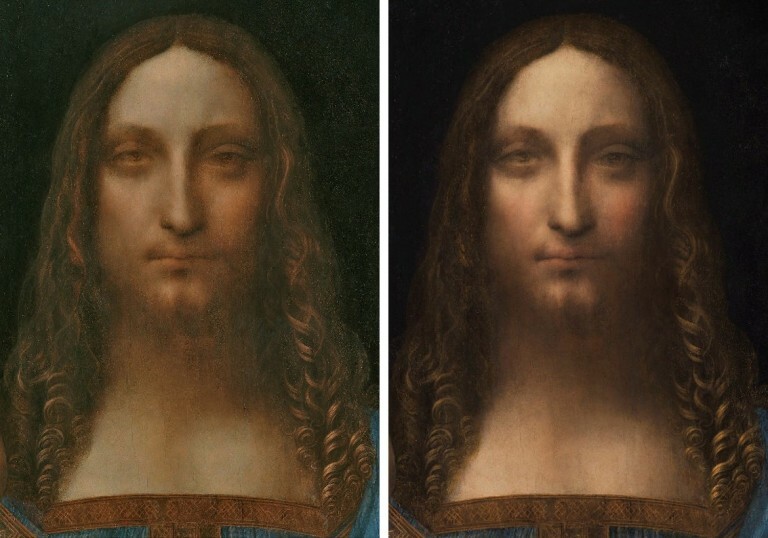 2: Detail – left, the New York Leonardo Salvator Mundi, as at the National Gallery in 2011-12 and, right, as when up for sale at Christie’s New York on 15 November 2017. Christie’s 2017 lot essay noted a “completion of conservation treatment in 2010” and gave no hint of a post-2012 restoration. Even though the painting had been known since 1900 in England as a Leonardo school work, had been rejected by Bernard Berenson, and had been spurned in Sotheby’s saleroom by Kenneth Clark in 1958 when it fetched £45, the National Gallery gave no hint of any further need for restoration when discussing the painting in its catalogue entry in 2011. Shortly before November 2017 the latest unacknowledged transformation was hiding in plain view in a subliminally brief time-lapse video puff where the painting morphs “miraculously” to a religiose musical accompaniment from its 1913 condition into its most recently restored state. This marketing wizardry can still be seen on the Guardian’s website here. Above, Fig. 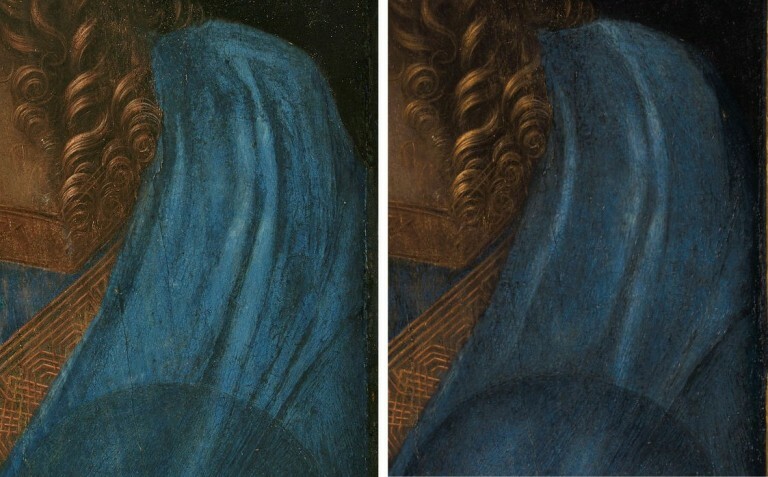 3: Left, the drapery at the left shoulder of Christ, in 2011-2012 at the National Gallery’s Leonardo exhibition; and, right, in Christie’s 15 November 15, 2018, sale. In December 2017, Christie’s was presented with photographic evidence assembled by Dr Martin Pracher, a German Lecturer in technical art history, and an assessor of paintings’ condition, that showed changes to the shoulder drapery between 2012 and 2017. 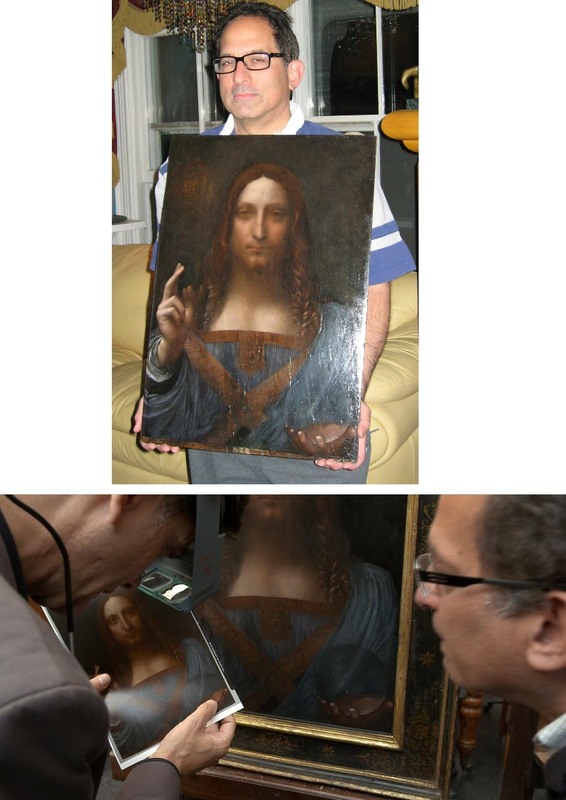 A spokeswoman disclosed that the picture’s original (2005-10) restorer, Dianne Modestini, had worked on the painting “Prior to its presentation for sale at Christie’s”. (See “Auctioneers Christie’s admit Leonardo da Vinci painting which became world’s most expensive artwork when it sold for £340m has been retouched in the last five years”.) Specifically: “Modestini partially cleaned the passage of paint in the shoulder and the dark streaks disappeared”. The spokeswoman added: “To imply something incorrect has taken place would itself be incorrect”. The recently “disappeared” folds, it was insisted, were not folds but “dark streaks” that appeared accidentally during the 2005-2010 restoration. WHEN IS A STREAK NOT A STREAK? Photographic evidence published in Modestini’s report offers some credence to her solvent-led explanation (see Figs 5-7) but Christie’s December 2017 response strained credulity further with the extended claim that Modestini’s cleaning solvents, having first made visible what had been invisible, had recently made invisible what they had made visible a decade earlier. We sketch an alternative and more plausible hypothesis. Above, Fig. 4: In this greyscale sequence, we see the shoulder as exhibited at the National Gallery in 2011-12, left; as seen, centre, at Christie’s November 2017 (after Modestini’s only recently acknowledged intervention); and, right, as in an earlier infra-red image. 1) This work was, since its discovery in 1900, an unrecognised autograph Leonardo that had suffered massive restoration injuries and adulterations in the past, all of which, since 2005, have been successfully mitigated/masked/ by a single restorer’s further repairs and repainting, some of which have been recorded and some not. 2) This picture is a school work on which the master (Leonardo) intervened in one or two places and is not, therefore, a finished and entirely autograph Leonardo painted prototype for the group of twenty or so Leonardesque Salvator Mundi versions. If we are to talk Leonardo da Vinci, we must talk of supreme painterly accomplishment. 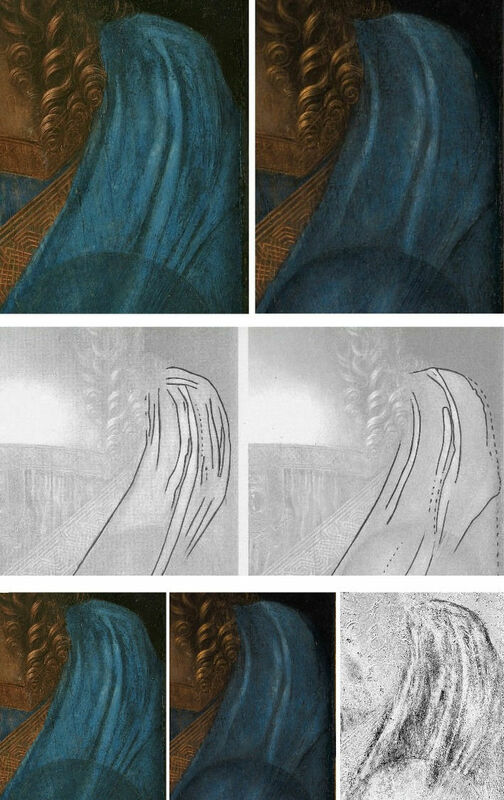 If we are to talk of an autograph painted protoype by Leonardo we should identify derivations from it in the many other Leonardesque Salvator Mundis and demonstrate a parity of artistic qualities with those encountered in historically recorded bona fide Leonardo paintings. 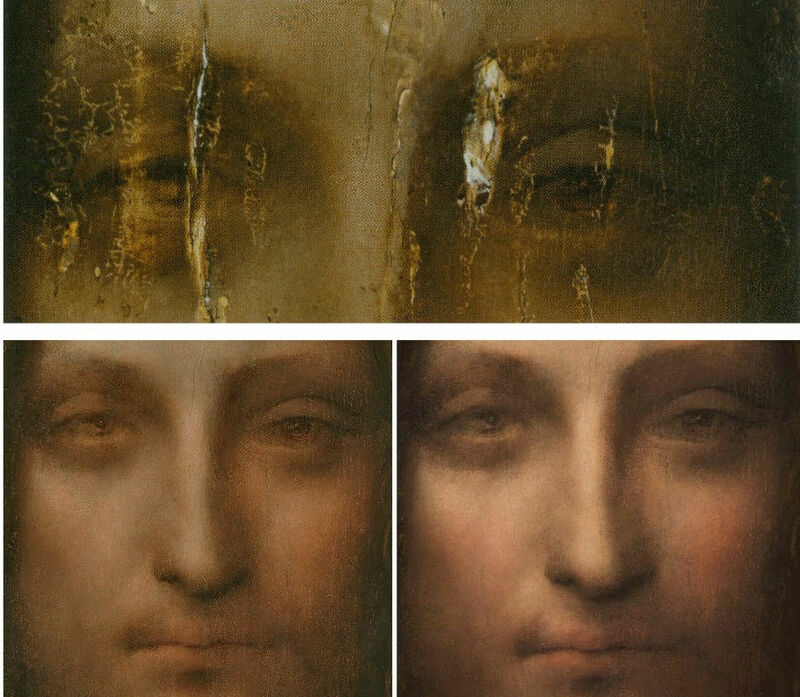 If we are to talk Leonardo on the back of an only very recently upgraded, greatly injured and much restored painting, we must first talk of picture restoration’s methods, consequences and role in attribution upgrades. Restorers undo and redo pictures. The first is quasi-archaeological and risks misdiagnosis and abrasive/chemical injuries. The second is reconstructive in a quasi-artistic sense and risks adulteration or falsification. Restorers strip off what they judge inauthentic and paint-on what they think might recover/simulate lost original and authentic appearances. The former is notoriously if not inherently destructive because restorers bear down with their solvents and scalpels on picture surfaces which carry artists most considered and final adjustments (see comments at Fig. 9). The latter is a fraught, presumptuous ambition that can be exercised with greatly varying levels of skill and artistic/anatomical comprehension (see figs. 10 and 11). Restorers are forever debating the ethics of attempting to reconstruct with their own modern materials the lost original surfaces of paintings. Whatever their outcomes, for good or ill, restorations facilitate attribution upgrades because “restored” works become new, hitherto-unseen works with “out-of-history” states that permit experts to discard previous judgements without professional embarrassment. Above, Fig. 5: The drapery at the left shoulder of Christ. 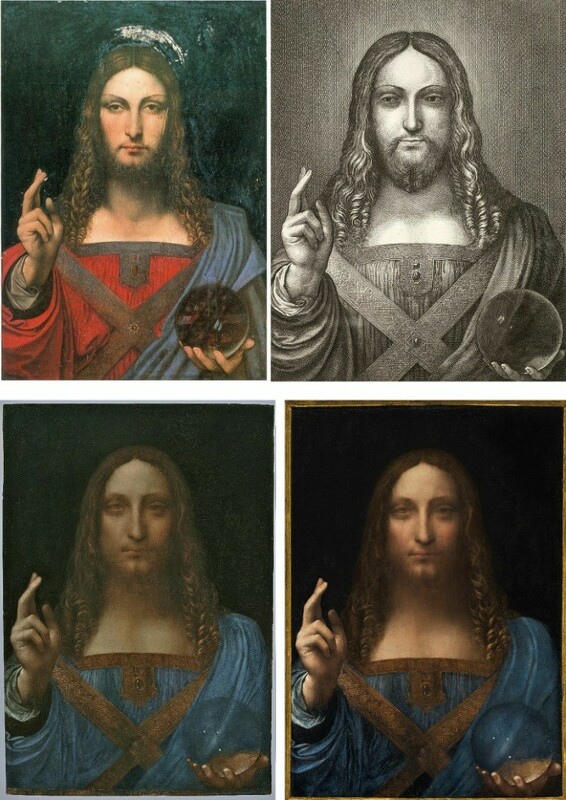 First left, as seen in 2005 when the Salvator Mundi was taken by one of its then owners, Robert Simon, an old masters dealer, to Modestini’s studio. Second left, in 2007 when the panel had been repaired and stripped of varnish and repaint. Third left, as exhibited in 2011 at the National Gallery. Right, as sold at Christie’s in November 2017. Above, Fig. 6: In the top, left, row we see the drapery folds as exhibited at the National Gallery in 2011-12 and, right, as when sold at Christie’s in 2017. Anyone might establish the extent of the changes by simply tracing photographs as above, middle row. Recent digital advances have made it possible to “subtract” a former state from a later one and represent the “differences” as dark shapes on a light ground, as above, bottom row, right, in a graphic prepared by Gareth Hawker. That graphic indicates with the clarity of a brass rubbing the location of material that had been added within the confines of the shape of the blue drapery. Moreover, visual appraisals of the 2011 and 2017 states of the painting show that changes had not been confined to the shoulder drapery but were present throughout the painting. In the details shown above, for example, it is apparent that the circumference of the orb has been strengthened by darkening (as is discussed below). Above, Fig. 7, top row: First left, an engraved copy of 1650 by Wenceslaus Hollar of a Salvator Mundi attributed to Leonardo in the collection of Charles I. Second left, a 1913 photograph of the present Salvator Mundi when in the Cook Collection, England. Third left, the Salvator Mundi as it arrived at Modestini’s studio in 2005. Right, the Salvator Mundi in 2007 after it had been repaired and cleaned. Above, Fig. 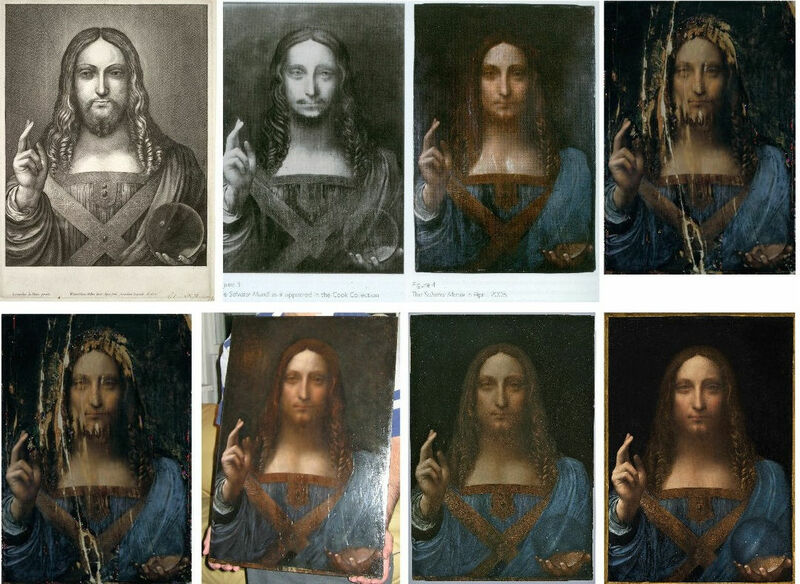 7, bottom row: First left, the Salvator Mundi in 2007 after it had been repaired and cleaned. Second left, the Salvator Mundi in 2008, after its first restoration and when about to be taken to the National Gallery. Third left, when exhibited at the National Gallery in 2011. Right, as when sold at Christie’s in November 2017. In the sequence above we see the painting near the end of its first stage of restoration in 2008, top, and, below it, at the end of its second stage of restoration in 2011. Here we use the term “restoration” in the specialised sense of restorers who often draw a distinction between cleaning (stripping down) and repainting (which they euphemise “retouching”). In such trade usage the term “restoration” is applied to the post-cleaning repainting, not to the whole treatment. Injuries can occur in both the stripping and the reconstructive stages. Because of the decline in traditional art teaching practices the pool of painterly expertise is dwindling and for many restorers today conducting their own repairing stage, after stripping off earlier repairs, can induce panic (a workshop conference was called recently to enable restorers to pool experiences, swap recipes and “learn by looking and listening [in a] welcoming and supportive environment”). For more confident practitioners the occasion can unleash over-reaching quasi-artistic ambitions. Above, Figs. 10 and 11: However good their intentions, however avowedly “ethical” their professional codes, restorers, like forgers (who are often themselves restorers or ex-restorers), cannot avoid leaving personal imprints and those of their cultural milieus in their repainting. The more ambitious the aspirant, the more deficiencies of artistic reading and anatomical understanding can be imposed on mute works of art. The Louvre Veronese restorer above seemed in thrall to the pneumatic forms and miniaturised features of Botero. That such eccentric aesthetic predilictions should ever have been institutionally authorised might augur badly for the Mona Lisa herself in a Louvre Museum today where curators are binging on radical restorations as they play catch-up with the technological adventurism long-encountered in British and American museums. Dianne Modestini’s notion of help without suppression is oxymoronic: you help or enhance by applying new paint onto…the surface you have stripped…and, thereby, suppress or amend the values you have revealed – why else would you intervene with paint at all? Conceptually speaking, restorers treat or present this part of their work work as a matter-of-fact mechanical/optical process when what you do is determined by what you think, how you see, how you “read” visual phenomena, how art historically informed you are, and, to an invevitable degree, by the professional circumstances under which you are operating. If you think and are assured that you are working on a Leonardo, how can you do other, in conscience, than steer the picture towards a more satisfactory realisation of your conception of that artist’s work? There is another specific danger: if you apply lots and lots of paint over a long period you produce a progressively altering painting that is not only based on your own initial assumptions but one that is increasingly being made in accord with your own previously incorporated modifications. By stealth you confer a superimposing material form of your own conception of what the work should be like and should further become. Apart from any guidance that may be being given by others in the studio, this work is otherwise done privately, free from external professionally disinterested appraisal and artistically informed criticism. Modestini disclosed in a television interview that she became greatly attached to the painting and found her eventual separation from it emotionally painful. SO WHY CHANGE THE OVERALL APPEARANCE OF AN ACREDITED LEONARDO? Above, Fig. 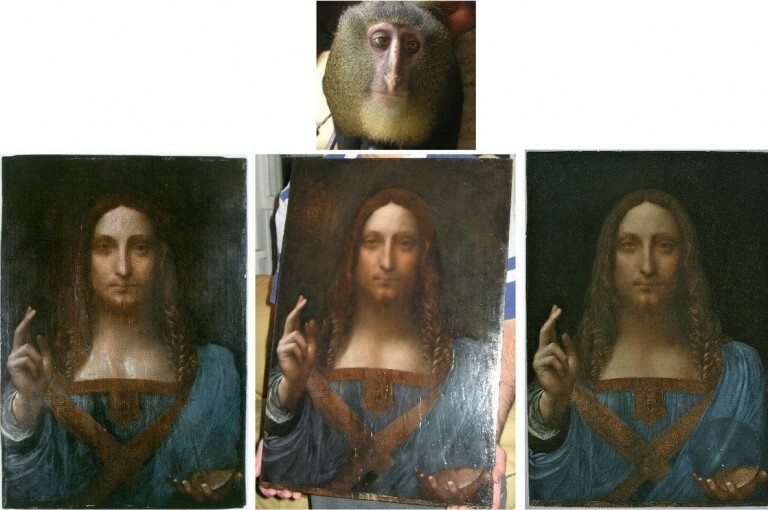 12: In this sequence we see how the face’s distinctive bug-eyed, long thin bent-nosed monkey-like anti-classical appearance on acquisition in 2005 had persisted throughout the 2008 visit to the National Gallery and into the 2011-12 stay in the National Gallery’s Leonardo exhibition. What might account for the substantial covert post-2012 re-restoration? In the absence of information and reports we must speculate. It can be said that for the credibility of so elevated an ascription as an entirely autograph Leonardo da Vinci it is imperative that a clear “fit” be evident with secure works within Leonardo’s oeuvre. Anything anomalous or discordant becomes a threat that must be explained away by being incorporated as an especially confirming feature within the attributed work’s New Narrative . For example, when Professor Martin Kemp was actively engaged as an advocate of another proposed Leonardo, the mixed media drawing on vellum he dubbed “La Bella Principessa”, he contended that atypical or previously unknown features (including working in a medium “that has not previously been seen”) can safely be taken as a “new facet” of the artist’s engagement with his circumstances. Perhaps. But when a work has been specifically likened to the greatest and most maturely sophisticated works of Leonardo the bar has been set extremely high and the scope for great surprises is reduced. For the owners and professional champions of this Salvator Mundi – a work that was very soon afterwards to be offered to the market – the scholarly rejections that attended the National Gallery exhibition might have seemed disappointing, if not alarming. Today we see three principal cross-linked concerns with the painting that has recently sported two separate identities – the one displayed at the National Gallery and the one worn for the recent sale. The problems are: the painting’s appearance; its (lack of) provenance; and the (over-heated) means of its promotion and accreditation. “Snow-Smith has shown that King Louis XII and his consort, Anne of Brittany, were particularly devoted to Christ as Salvator Mundi, and that they could connect this cult with the Mandylion of Edessa twice-over we now see. Given the date – around 1500 – of Leonardo’s preparatory drawings [only two sheets of drapery studies], the style of the picture and its association with a French princess, Louis and Anne become the most likely patrons for Leonardo’s Salvator Mundi, probably commissioning the work soon after the conquest of Milan and Genoa. This would therefore be one of the French commissions mentioned by Fra Pietro Novellara. 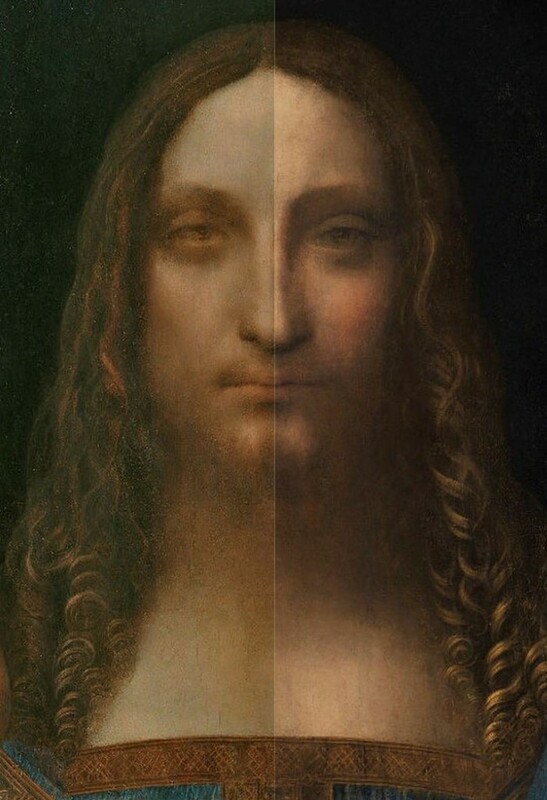 And it was perhaps to accommodate their wishes that Leonardo based Christ’s features, the set of the eyes, the heavy lower lids, and especially his smoothly arched eyebrows [sic] down into a long nose, on the Christ of the Mandylion of Edessa.” Emphases added. How can you extract a “would therefore be” from a “could”, a “most likely”, and a “probably”? In lieu of a single hard shiny fact, we are offered a forest of fancies, maybes, perhaps’s and scholarly borrowings. 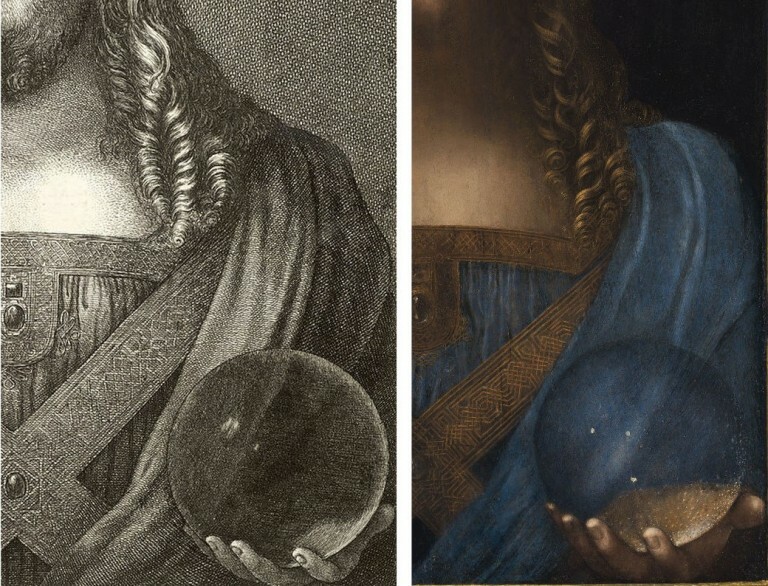 Even if the claimed correspondence between the New York Salvator Mundi and Hollar’s etched copy had been visually compelling – which on many counts it is not – the etching’s ascription to Leonardo would still need treating with caution. Max Friedlandler warned in On Art and Connoisseurship: “The inventories of princely galleries – such as those of Margaret of Austria, Vicereine of the Netherlands, or of King Charles I of England…are to be utilized sceptically and to be taken seriously only to the extent that facts derived from style criticism do not contradict them.” With the New York Salvator Mundi’s countless stylistic incompatibilities, attempts to press a correspondence with the Hollar are quite counter-productive. Above, Fig. 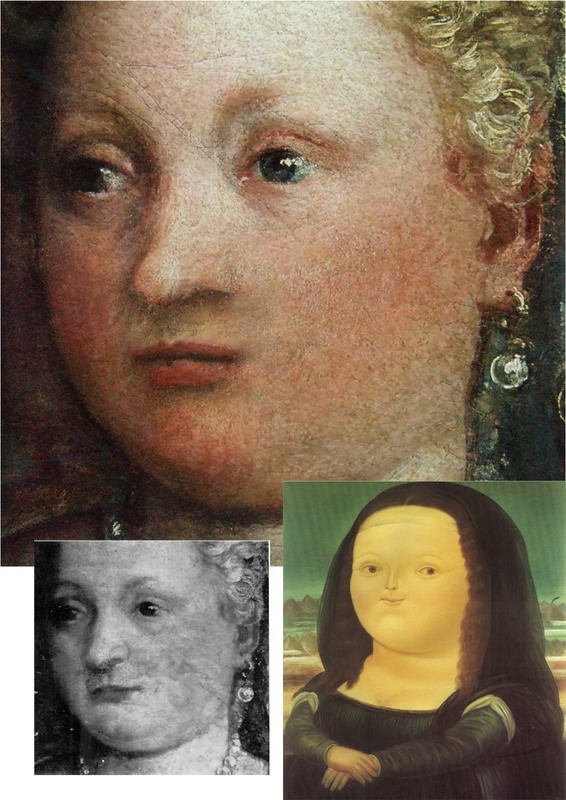 13: Top row, left, the “de Ganay Salvator Mundi” (the painting had formerly been in the collection of the Marquis de Ganay, Paris); top row, right, the 1650 Hollar etching. Bottom row the New York Salvator Mundi in 2011, left; and in 2017, right. 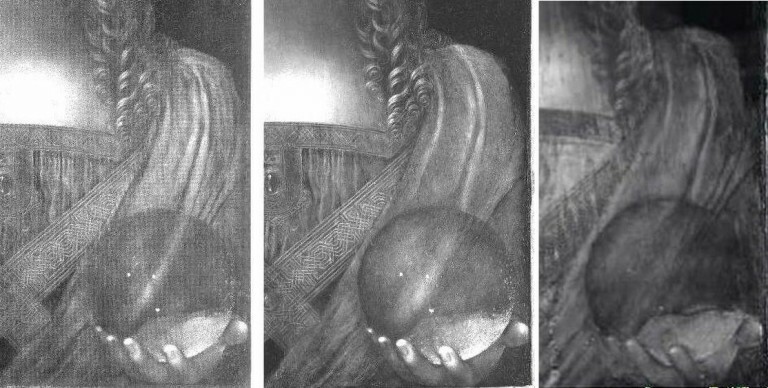 The de Ganay picture, top left, was proposed in a scholarly article in 1978 and a book of 1982 to be an original Leonardo painted prototype for around twenty Leonardo-like Salvator Mundi paintings. That attribution did not find general favour but the case advanced for it by the scholar Joanne Snow-Smith provided a template for the New York Salvator Mundi. It, too, was said to have been the painting etched by Hollar, above, top right. Its material composition was also said to have passed the technical tests of its day. 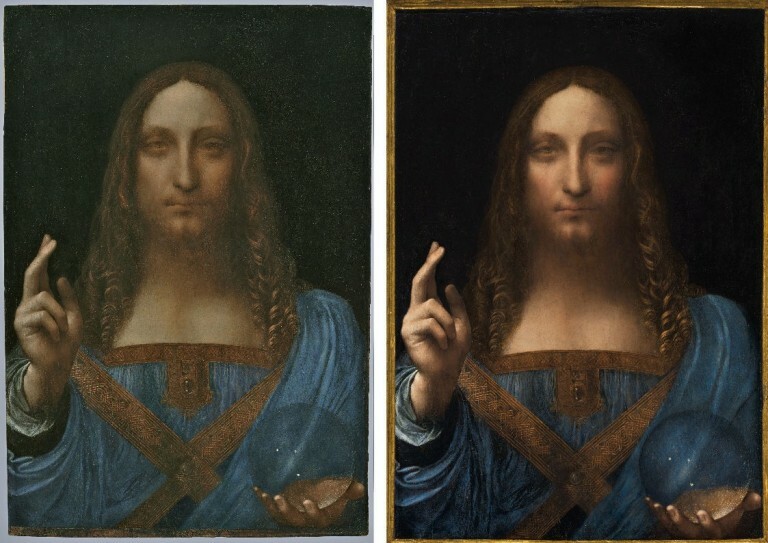 Its paintwork, too, betrayed no discernable brushwork – in this last respect both of the proposed Leonardo protypes are physically unlike such secure but heavily cracked bona fide Leonardo works as the Mona Lisa and the St. John the Baptist. While both of the two painted versions shown above, left, are said to have provided the model for Hollar’s etching, in neither case is this plausible. Both have the complicated and rather ugly configuration of drapery folds at the true left shoulder in which a horizontal fold runs below the below the shoulder creating an epaulette-like touch of power-dressing that is not present in Hollar’s copy. The alteration of the New York version’s shoulder drapery thus might be thought to have conferred two stylistic benefits: it makes a closer fit with the Hollar copy and it puts distance between itself and an earlier failed contender as an original painted prototype by Leonardo. The face in the Hollar is long thin, bearded and tapering, as is that in the de Ganay painting. In contrast, the face in the New York picture emerged from the first restoration with an entirely disqualifying lopsided shape that was markedly wider at the jaw than at the cheekbone and thus combined a chipmunk-like aspect with a monkey nose. The latest post-2012 shading on the face of the New York picture has served to narrow the lit lower face and make the overall aspect more symmetrical. Similarly, Modestini’s widening of the right nostril aperture (see Fig. 19) masks another anatomical solecism in a purportedly hierarchic frontal classical face, which, Modestini assures us was “deliberately adapted by Leonardo from a Byzantine prototype and also used by Giotto in the Peruzzi Altarpiece in Santa Croce, with which he was certainly familiar…” Similarly, too, for Syson the question is re-begged: “the face of Christ – rigid, symmetrical, absolutely frontal – is deliberately archaic. He seems to have been aware of the central panel of a polyptych ascribed to Giotto and his workshop…” Two asserted “deliberatelys” do not a secure fact make. The idea of Leonardo as a backward looking archaistic figure is a notion that finds realisation in only two works: the proposed Leonardo drawing “La Bella Principessa” – which has no history before its emergence in 1996 from the studio of a painter who became a friend of Berenson and a restorer of …Leonardo, among others; and, the recently upgraded New York Salvator Mundi. The argument is circular. If ever Leonardo might have been tempted to do a frontal, backward-looking hierarchic face of Christ it would have been on his triumphantly frontal, wall-asserting mural The Last Supper. Instead, of course, he carved space by playing every head and limb off against the unseen picture plane. Without the Hollar connection this Salvator Mundi’s provenance begins only at 1900 four centuries after its supposed execution. The pre-1900 history is problematic. It is not known from whom, where or when the picture had been acquired by Sir Charles Robinson who bought the work as a Bernardino Luino for the Cook Collection. We have been informed that an English fossil-hunter, Thomas Hawkins (1810-89), seems to have donated a “Leonardo Salvator Mundi” in 1848 to a church in Birmingham. That church was closed down in 1895, at which date its collection was presumably disbursed. Had Robinson bought it from that church? Or, were there two claimed Leonardo Salvator Mundi versions then at large in England? To complicate matters, the whereabouts of a third version formerly in the Worsey and Yarborough Collections is presently unknown. So there might have been three Leonardo Salvator Mundi candidates in 19th century England. The Cook collection picture’s provenance ran into the ground in 1958 when sold by Sotheby’s for £45. Between 1900 and 1958 no one thought the New York Salvator Mundi to be a Leonardo. Christie’s 2017 sale provenance ended: “Kuntz, Private Collection USA”. Sotheby’s have no additional information on Kuntz. Wiki has an entry on a US artist Roger Edward Kuntz, a talented painter who wavered between abstraction and representation and died in 1975. In the early 50s he and his wife travelled for four months in Europe so that he could visit museums. They had a daughter in 1951. If Kuntz, an artist with a “pensive, thoughtfully naturalistic sensibility” made another European trip in 1958, might he have had £45 (at that date about a month’s wage for an unskilled worker in Britain) to spare on an old Italian painting? Roger Kuntz died in 1975 but was succeeded by his wife and daughter. If not that Kuntz family, what of others in the United States? A Kuntz family in Louisiana used to be avid collectors of paintings, antiques and historical documents. Rosemund E. and Emile Kuntz had two sons, one of whom donated a majority of their collection to Tulane University in New Orleans. As things stand we do not know the identity of the vendor in 2005 or the venue of the sale – which might seem odd in the world’s most information-rich country in the twenty-first century. 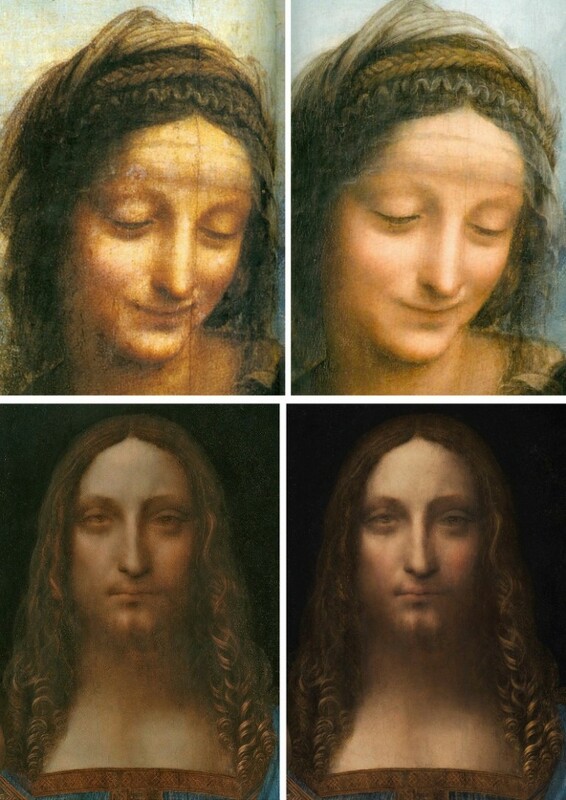 Given the still sticky varnish present on the New York Salvator Mundi in 2005 when the painting was bought for $10,000, it could be useful to establish the identity of the previous owner who would have information on the previous restoration and very possibly photo-records of the painting from 1958 onwards. Above, Fig. 14: Details of the Hollar etching and the 2017 version of the New York Salvator Mundi. Above, Fig. 15: In the top row above we see how greatly more commanding and authoritative is the design and sculptural massing of forms in the small etched copy by Hollar than in the much larger New York painting. It is inconceivable that Hollar, if copying the New York picture, would have changed so many aspects of the design and so greatly intensified the overall theatre of lighting and form-evoking shading. In the Hollar we see the central drapery ridge descending from the shoulder in a convex sweep before entering the orb’s circumference and then abruptly inverting from convexity to concavity – which aspect it maintains throughout its passage within the orb until, on exiting, it immediately reverts to convexity. 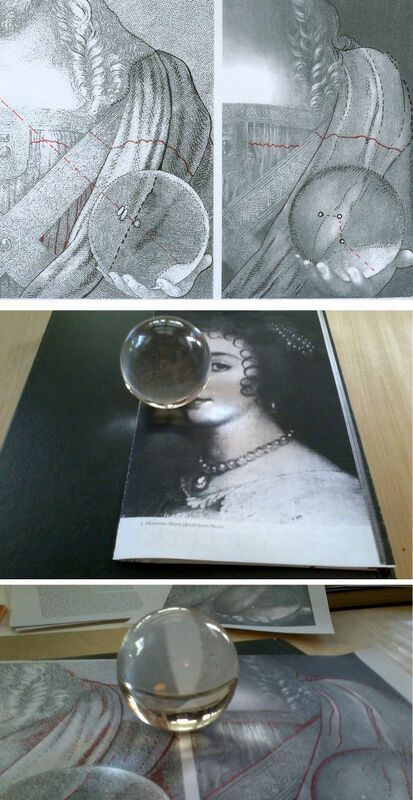 In the centre of our own glass “orb” (which lies on the surface) in the lower picture we see how the narrow parallel white division between the two photocopied diagrams at first disappears from view and then reappears, within the orb curving outward slightly on one side and more dramatically so on the other before beginning to converge at the approach the circumference. If the New York painting were a Leonardo that had been copied by Hollar, how likely would it be that the latter copyist took the liberty of making a more complex and scientifically astute optic within the orb than was present on the painting he believed to be by Leonardo? Above, Fig. 17: In this split image above we see the 2011 face on the left, and the 2017 face on the right. We can see the extent to which Modestini has intensified all the values present in her first version: she has lightened her lights and darkened her darks and warmed the hue of the cheeks. This rouging of the flesh is at variance with the face of the Mona Lisa. In effect, Modestini has treated her own 2011 second-state painted restoration as if it were an etcher’s proof and worked afresh on the plate before pulling a new, further worked-up state with intensified pictorial vivacity. In doing so she demonstrates a painterly expertise that is rare among restorers today and a sophisticated pictorial sensibility. However it is one, as shown below, deployed to arbitrary and ahistorical purposes. Above, Fig. 18: In the top row detail of St. Anne, we see how a major bona fide Leonardo in the Louvre has borne the commonplace “reductive” pictorial material-shedding brunt of radical restorations. Restorers, when challenged on their sculpturally flattening modernist impositions, invariably insist that what critics lament as losses were no more than dirt, disfiguration and arbitrary alien accretions. Curators should know better and for the longest time in the 20th century those at the Louvre did do so. In the bottom progression we see how Modestini avoided one picture restoration affliction only to effect another by imposing a ceaselessly-evolving painterly elaboration which comes to constitute a series of variations on a theme. 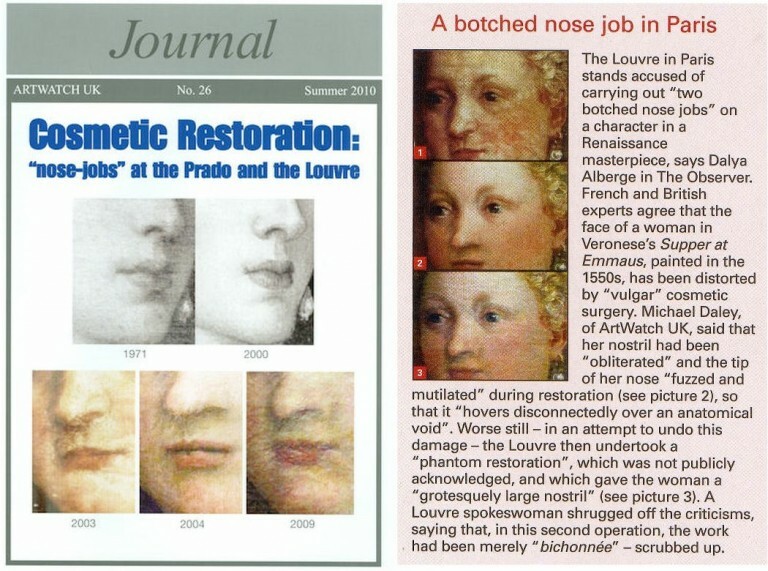 Above, Fig.20: Left, the cover of Joanne Snow-Smith’s 1982 book THE SALVATOR MUNDI OF LEONARDO DA VINCI; Centre, the cover of the owner’s account of his (so far vain) quest to authenticate the “La Bella Principessa” drawing; Right a poster for a talk given by one the original owners of the New York Salvator Mundi at the 2014 Annual Brunch for Friends of the Uffizi Gallery. This entry was posted on January 1, 2018. It was filed under blog.